Mount Kerinci is the highest volcano in Indonesia and also the highest peak in Sumatra Island. Reaching 3805 meters from sea level, Mount Kerinci is an active Volcano located in Bukit Barisan (literally means “range of hills”) Mountain Range. 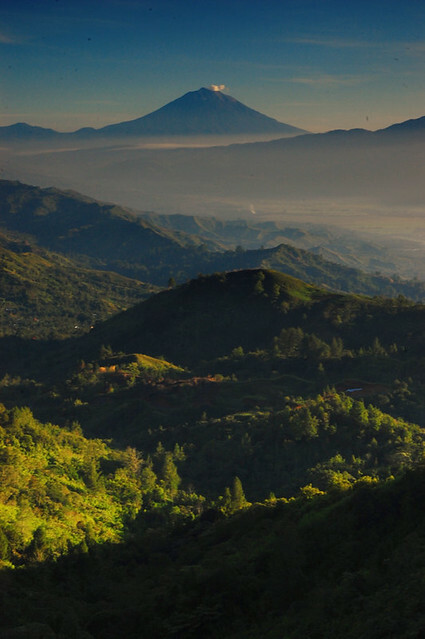 This range dominates the Sumatran landscape from Aceh to Lampung. The last eruption of Mt Kerinci occurred on June 2 2009. Mount Kerinci is located in Gunung Kerinci Regency, Jambi. It is a part of Kerinci Seblat National Park – a UNESCO designed World Heritage Site. The dense forest is home to the Sumatran Tiger and many other uniquely yet critically endangered species, and the forest completely surrounds Kerinci. Vegetation reaches 3300 meters high from sea level on the mountain slope. The summit has a 600 meter wide crater, partially covered by crater lake. Being the highest volcano in Indonesia and also the highest peak on the island of Sumatra, Mt Kerinci attracts many hikers. 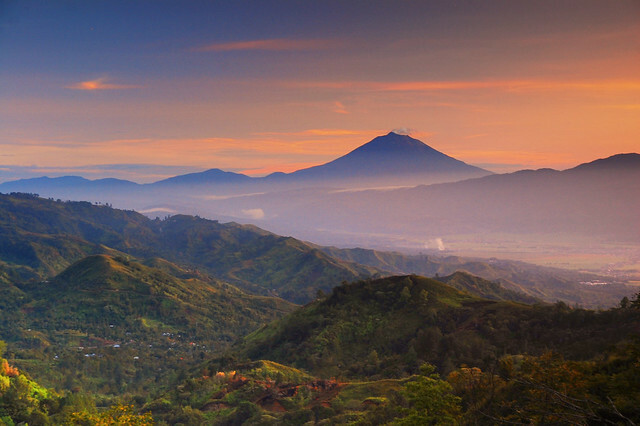 It is common to access the mountain via Jambi (province capital) or Padang, West Sumatra. Kerinci sits near Jambi and the West Sumatra border, so it is possible to access from both directions. Hikers from Padang begin their journey by bus or car to the Kersik Tuo Village, the last stop before hiking. From Jambi, hikers travel to Sungai Penuh via road before they begin their hike. Kerinci is usually muddy and wet during rainy season and even in dry season as well. Guides are necessary as there are cases of hikers disappearing when they try to hike alone without guide. As the surrounding forest is the habitat of wildlife, caution is required. Hiking routes often cross Sumatran tiger hunting grounds, so hikers must pay attention where to rest or camp. Two other main attractions in Mount Kerinci are the two lakes on its slope, Kerinci Lake and Gunung Tujuh Lake. Kerinci Lake is located in Kerinci Regency around 16 kilometres from Sungai Penuh municipality. The climate is mild as the lake is 783 meters above sea level. Kerinci Lake is a volcanic freshwater lake, its surface area is around 46 square kilometres. Kerinci Lake plays an important role for the surrounding communities, as it is the freshwater source for drinking water and agriculture. Kerinci Lake empties its water to two rivers, i.e. Segara Agung River and Batang Kali River. If Mount Kerinci attracts hikers, Kerinci Lake is a popular spot for tourists. Tourists must take around ten hours journey from Jambi via road to Sungai Penuh. 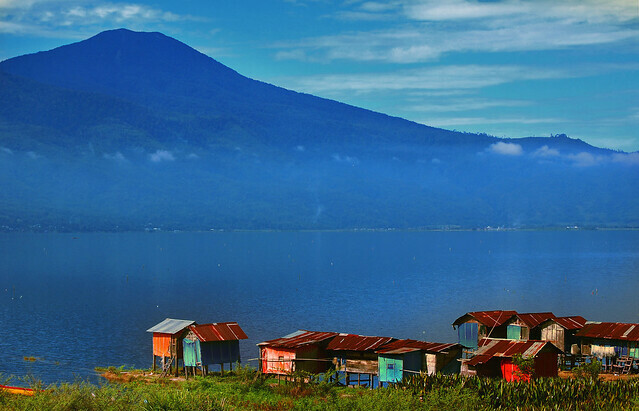 Unlike Gunung Tujuh Lake, Kerinci Lake is accessible by vehicles; cars, buses, or motorbikes. Gunung Tujuh Lake is located on the higher slopes of Mount Kerinci. Being at the altitude of 1950 meters above sea level, Gunung Tujuh Lake is the highest lake in South East Asia. The lake is located inside the Kerinci Seblat National Park. It is smaller than the Kerinci Lake on the surface area, only around 9.6 square kilometers. To go to Gunung Tujuh Lake, visitors must walk on foot from Kerinci Seblat National Park post gate. There are two routes to choose to go to the lake. As its name indicates – Gunung Tujuh means Mount of Seven – this lake is surrounded by seven peaks. From theses peaks, water flows from springs and pools in the lake. Other than ordinary visitors, locals also go to Gunung Tujuh Lake to catch fish.